Sustained hyperglycemia is closely associated with increased risk to develop nephropathy. We have previously reported alterations in the intrarenal oxygen metabolism already after the early onset of diabetes. Furthermore, formation of advanced glycation end-products (AGE) is postulated as a major contributor to diabetic nephropathy. 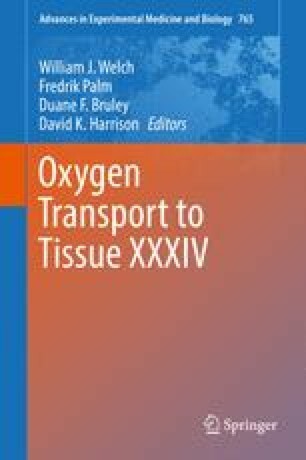 We therefore investigated the possible relationship between altered oxygen metabolism and AGE in diabetic kidneys. Normoglycemic and streptozotocin-diabetic rats with and without chronic treatment with aminoguanidine (AGE inhibitor; 600 mg/kg bw/24 h in drinking water) or L-N6-(1-Iminoethyl)lysine (L-NIL, iNOS inhibitor, 1 mg/kg bw/24 h in drinking water) were studied 2 weeks after induction of diabetes. Glomerular filtration rate (GFR) was estimated by inulin clearance, oxygen tension (pO2) and interstitial pH by microelectrodes and regional renal blood flow (RBF) by laser-Doppler. Histological changes were evaluated on fixed tissue. Glomerular hyperfiltration was unaffected by aminoguanidine, whereas L-NIL normalized GFR in diabetic rats. pO2 and interstitial pH, but not RBF, were lower in both kidney cortex and medulla compared to control rats, but was unaffected by both chronic treatments. Urinary protein excretion was higher in diabetic rats and unaffected by L-NIL, whereas aminoguanidine paradoxically increased this parameter. Damage scores were similar in all groups. In conclusion, diabetes-induced alterations in intrarenal oxygen metabolism are independent of the AGE pathway, and precede any morphological changes. These findings highlight the early stage of diabetes as being a metabolic disorder also in the kidney. This study was supported by the Swedish Medical Research Council (10840), The Swedish Society for Medical Research, The Magnus Bergvall Foundation and NIH K99/R00 grant (DK077858).